The review focuses on a subset of Weiner-Reed's "Memories" painting series. "Sometimes I do not even realize that I have donned a mask... That was the case in this instance and I was unmasked in the following art review ... In a good way. I always paint from my gut in an honest expression of my vision and emotions and personal experience. Yet, what this insightful (and intense) review revealed was my darker or deeper emotions contained in many works...in my "Memories" series, specifically, I painted about pain, grief, loss, confusion, denial, and void. Before someone moves on, however, I do want them to experience the core, my underlying content and the entire life contained within my paintings." We are never alone in our pain or our joy. These are universal truths. "Elaine Weiner-Reed Faces Deep Loss." "Elaine Weiner-Reed’s work in the New Century Artists Show, “Memories,” mines human emotion with an abstract expressionist sensibility. Like de Kooning and Grace Hartigan, Weiner-Reed does not eschew the figure in her work and uses black gestural line to great effect. Here, it is one of the primary elements as she strives to break boundaries of emotional limitations. 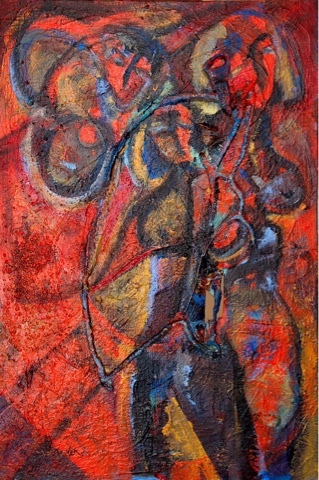 She allows red and black to predominate in this series, of figurative subject matter, rendered with minimum detail, in a range of hues and strong lines. She, thus, provides an artistic filter that is visceral, chaotic and painful as she tries to cope with and understand transient finality. This artist has always been a fighter against the status quo. Undaunted by prosaic artistic minds throughout her career, she vigorously has created paintings and sculptures exploring uncharted places. In this show, her territory is the minefield of human emotions that erupts when there is a profound, personal loss, a rupturing of a seamless thread of existence broken forever, with which one must come to terms. 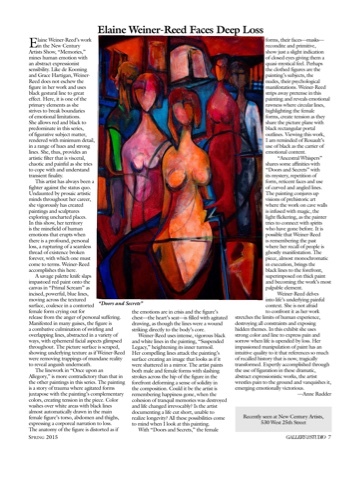 Weiner-Reed accomplishes this here...."
The painting highlighted in the article is fantastic. Interesting to see the direction your artwork has moved since this exhibit. The anxt must have diminished and the joy is resurfacing. Love both sets of work.